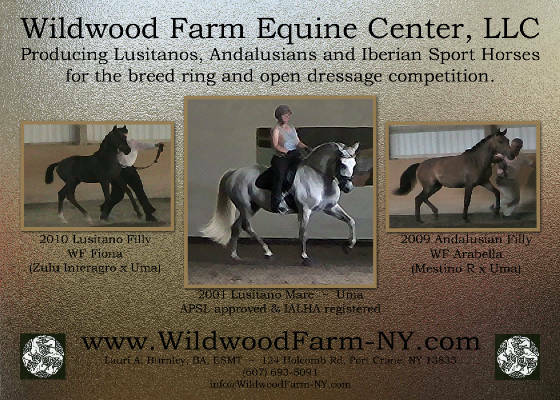 Wildwood Farm Equine Center LLC is a Lusitano breeding facility located in upstate New York. We are focused on producing quality Lusitanos for the breed ring and open dressage competition. We will once again be sponsoring the IBC Lusitano class on Tuesday. And will be showing WF Fiona & WF Loura in the IBC Iberian Horse class and the IBC Lusitano class. Come join us in the show ring! representing the Lusitano breed and Wildwood Farm. Checkout our FaceBook business Event page for the most up-to-date information.